The other week I was asked to be part of the Creative Blogger Tour - talk about an honor and a surprise! The tour is an invitational hop where you answer questions about your creative process, kind of a quick peek into the minds of creative CTMH bloggers! When you check out the blogs of the previous nominees you'll see why I was so gall darn pleased to be asked - these ladies are some of my creative heroes! I just finished up my monthly Card Buffet classes tonight - look at that bit of crazy in the picture below! These classes are tons of fun but a lot of work to create! This month I had 12 new holiday themed projects and brought back 22 previous general themed projects for a whopping 34 different items people could make during a 2 hour all you can create buffet. These boxes are the ones that still had a few projects left at the end of Sunday's class. My next big project will be getting items ready for the Si View Holiday Bazaar on Saturday, 6th December. I have lots of ideas, a stocked Pinterest board and tons of supplies ready for me to go on a crafting binge and about 2 weeks of actual crafting time to get it all done! My daughter is coming home from college for Thanksgiving break and I'm thinking I won't get much crafting done while she is home so this coming week is going to be full of sock cupcakes, gift card holders, Santa and Snowman Hershey Bar Sliders, Christmas cards, Elf Chocolates, Base and Bling Pendants and more! Ask a girl a hard question! I think most CTMH girls have a great eye for color and design so beyond that I think my specialty is using our Cricut cartridges and creating projects that can be made in a class setting. I adore seeing creations that obviously took hours to create but most of what I create winds up in a class later on so I try to keep to things that can be copied by a range of crafting levels. For the past couple of years I've been designing online using CCR and now Design Space so I offer a lot of free cutting files using our amazing CTMH cartridges. I like to think of it as putting a little good out into the world and I love it when people send me notes letting me know they've used a file I created! I think creativity is an essential element for people to have in their life for their mental well being. Creativity doesn't have to be crafty - it can be cooking a meal or building a stone wall or making Lego sculptures with your kids - anything that engages your hands and your brain in creating something new. I always joke that there are two things that keep me happy and sane - doing Martial Arts and doing papercrafts. If I miss either for more than a few days I start feeling a bit cranky. One of the reasons I love being a Close to my Heart Consultant is because I get to bring wonderful ladies together and offer them an activity that nourishes the creative part inside so they always leave with a smile on their face and in their heart. My crafting helps make my corner of the world a little bit brighter and cuter and I get to spread the joy with friends. Who wouldn't love a job like that? Another tough one to answer! Necessity is the mother of invention and a lot of times it is what spurs my creativity too! I can spend hours looking at Pinterest and blogs and get nothing done. When I have a hard deadline for something to be finished then my creativity goes into drive. I am by nature a very practical person so my best work is spurred by having a specific person or event to create for - there is nothing that gets my creative juices flowing better than a party to decorate or making a gift! Beyond that I often find myself paging through the CTMH Cricut handbooks to pick out cuts I haven't used yet or flipping through my stamp collection and picking out a theme based on a stamp. I love looking through our Idea Books (I have them going back to 2006!) and our How-To books for ideas on color combinations and layouts for projects. Sometimes I'll just flip through my paper collection and pick out a paper that I want to use and let the project flow from there. So that is a look into my messy, fun, practical mind and now I get to nominate the new blogger on the Tour! It is my great pleasure to announce Dawn Ross has agreed to be the next stop on your tour! Be sure to visit her next Monday for her post! Thanks so much for stopping by today and spending some time with me! Stay crafty my friends! Thanks for sharing the secret to your creative genius! 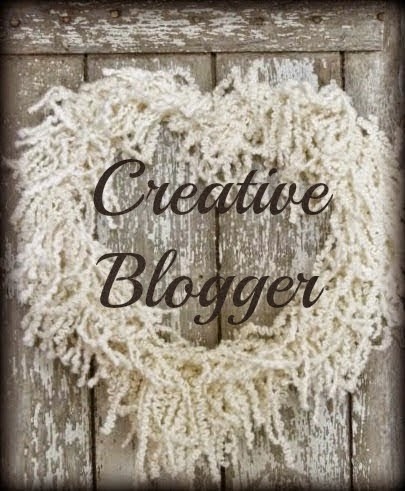 And, thank you for the nomination for the Creative Blogger Tour!